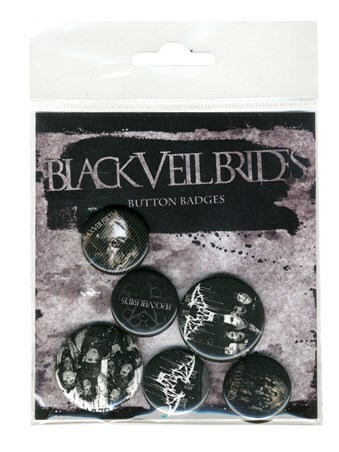 Music Badge Pack: If you are a life long Bridesmaid then make sure you get your hands on this gorgeous button badge pack which features the American rock band Black Veil Brides. Including six awesome designs, this badge pack features Andy Biersack, Jinxx, Christian 'CC' Coma, Ashley Purdy and Jake Pitts as they pose for images from their 2012 album 'Wretched and Divine' as well as a paint splatter motif of the bands iconic wings motif and the double B logo. This accessory pack is sure to make a great gift for anyone you know who loves the BVB's. High quality, framed In the End, Black Veil Brides badge pack with a bespoke frame by our custom framing service.